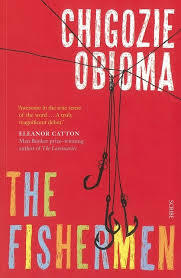 LIKE the Seven Killings book (also long listed for the Man Booker), this has the patois of the street, albeit related from Michigan now where Obioma is a Fiction Fellow, which sort of sounds right too, an FF. It perhaps helps if you are used to the dynamics of extended families. And these boys are a rumbustious handful of scallywags. The style, I am informed, is to follow the west African tradition of story telling at which their mother is adept. She relays precisely the misdemeanours of the young brothers to the said father who returns each week, usually to administer a belting. It is Lake Woebegone meets Omi-Ala, a dreadful river. “Mother was a falconer….She owned copies of our minds in the pockets of her own mind and so could easily sniff troubles early in their forming, the same way sailors discern the forming foetus of a coming storm”. A notable theme of the Man Booker 2015 candidates is the strength of the writing, the penmanship if you like, over the more traditional virtues of the novel – plot, characterisation, narrative, description, relationships. There is a lot of I. And more I. This entry was posted in Biography, fiction and tagged Akure, Booker long list, Chigozie Obioma, Fiction Fellow, Man Booker long list, Man Booker short list, Nigerian fiction, Nigerian writing, West African story telling. Bookmark the permalink.